Some of our Otay Crossing Self Storage team members have visited The Living Coast Discovery Center. Our facility manager, Adrian Nuno, describes it as, “…a neat place, sort of like a mini museum with live animals. We did arts and crafts with the kids and got to pet some animals. 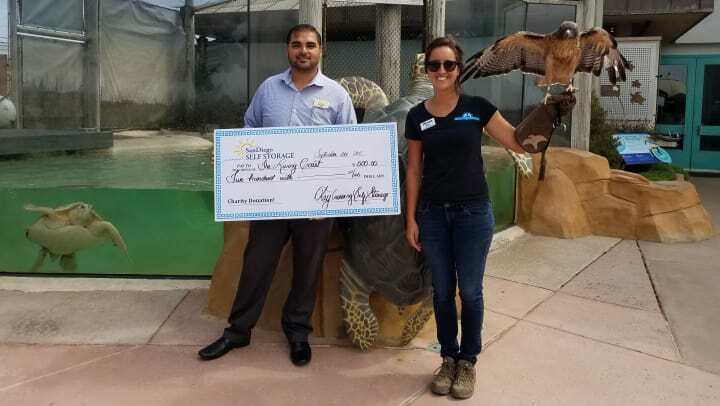 It was a lot of fun!” When the team learned that Living Coast is a non-profit organization committed to providing K-12 educational programs, caring for native plants and animals, and providing visitors with an interactive hands-on experience, they wanted to lend some support. The Living Coast celebrated 30 years last year and remains focused on educating local K-12 students. When kids come to the Living Coast for a field trip or camp, they are immersed in nature and learn about local wildlife that can be found in their own back yards. They also learn how they can make a difference in our environment through changes in their daily lives at home. Last year, more than 25,000 students came through the doors for field trips and camps, and an additional 5,000+ students took part in the school outreach program where Living Coast staff members adapt the field trip program for the classroom for those schools unable to travel to the Living Coast Discovery Center. Additional programs for families and visitors include VIP Animal Encounters, Birthday Parties, Overnight Adventures, and Trail Hikes! The Otay Crossing Self Storage donation helps to continue to maintain the life and health of San Diego Bay’s native animals and plants on one of the few remaining salt marsh wetlands on the Pacific Coast.